After passing a resolution that condemned organ transplant abuses in China in late 2013, the European Parliament returned to the issue recently, with a detailed examination of China’s practices and promises for reform, and ideas for what member states can do to tackle the practice. China is unique among countries for running an organ transplantation system built upon abuse. China’s transplant authorities claim to primarily use organs from death row prisoners, which according to international standards is a grave violation. But many researchers challenge this claim, saying the main source of organs comes from prisoners of conscience who are expressly slaughtered for the purpose. In other countries, transplant abuses typically happen on an individual scale, with the poor trading a kidney, for example, for a five figure sum. The Chinese state’s involvement in the practice, and the difficulty of determining whether abuses have been thoroughly stopped or merely papered over, poses challenges for policymakers in Western countries who seek to prevent abuses and get accountability for what has passed. “We need to remain fair, but critical, both in terms of the track record of China on the matter, and the allegations and evidence,” said Miroslav Mikolasik, a Slovak member of the European Parliament and a member of the subcommittee on human rights. 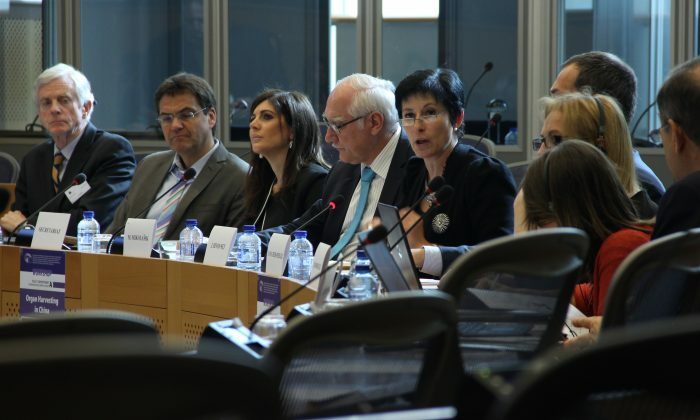 Mikolasik spoke at a workshop titled Organ Harvesting in China organized by the European Parliament’s Committee on the Environment, Public Health, and Food Safety. Held in Brussels on April 21, it featured European officials, medical researchers, and outside doctors and experts. “We also have need to be responsible, constructive, and come up with timely legislative measures that would stop European patients from being complicit in any way with this practice,” Mikolasik said. The “practice,” such as it has been known to take place in China, has two problematic components, according to Joëlle Hivonnet, an official who deals with China at the European External Action Service, the diplomatic and communications department of the European Union. “The extrajudicial killings result from ill treatment and torture of prisoners. Prisoners can basically be disappeared, either in the regular prison system, without even the family members being aware,” she said. Chinese officials claim reforms are now taking place in the Chinese transplantation system. These include, most prominently, the cessation of the use of organs from death row prisoners. Huang Jiefu, the former vice minister of health and current head of the Organ Transplantation Committee, China’s peak body for coordinating transplant policies, made clear in March that this was the intent behind the new reforms. This was a distinct change in the official posture, which had previously allowed the continued use of prisoner organs, as long as the individuals were consenting. In March Huang closed even this avenue, ruling out prisoners as a source of organs entirely. Some researchers are wary of this updated promise, saying that it is virtually impossible to independently verify these claims, given the lack of transparency of the Chinese transplantation system, the obfuscatory explanations of organ sourcing by officials like Huang, and a lack of clarity about whether military hospitals are also beholden to the new rules. International engagement with China on transplant policy will nevertheless resume, according to Dr. Francis Delmonico, the former head of The Transplantation Society who led discussions with Huang Jiefu in previous years. Speaking at the workshop, he said that international medical organizations would hold a conference in China this summer, helping the authorities there with their establishment of an ethical transplantation system. Huang Jiefu promises Francis Delmonico that China will no longer use organs from prisoners as long as he is in charge. And yet there are no laws on the books banning the practice, nor do there appear to be any plans by these groups to hold Chinese authorities accountable for what has been termed the “slaughter” of tens of thousands of prisoners of conscience for commercial reasons. Huige Li, a representative from Doctors Against Forced Organ Harvesting, a medical advocacy group, spoke in detail at the workshop about how these transactions took place, providing a case study of the former police chief of a northern Chinese city. “That means several thousands died from his research,” Dr. Li said. He ran through the statistics: in all of China over the years of Wang’s research, roughly 6,000 executions took place. Jinzhou, with a population of about 3 million people, would have executed about 14 criminals, Dr. Li said. But Wang said his organ transplantation experiments—almost certainly coincident with death of the donor—involved thousands of subjects. Dr. Li said the population that made up this shortfall—people who were not death row prisoners, but were killed extrajudicially for their organs all the same—were most likely practitioners of Falun Gong. There is no conclusive proof of the identity of those killed in this fashion, or of Dr. Li’s inference, though it is one that conforms with a mosaic of other known facts. And among those concerned with the matter, there is spirited disagreement about precisely what that ought to consist of.